It's been over 2 weeks since S16 battlements went down and a week since we missed post season and we haven't received the missing silver and packs yet, when should we expect to receive them? Dema doesnt care haha. He doesnt even check his mail never mind forums! I feel that it is only fair for S16 folks to receive one fire ruby and 7 million silver as compensation. Don't think the other servers need compensation as it was the combination of both battlements and post season not working that set S16 back compared to the rest of the servers. I concur. My growth and progress have been stunted by lack of both battlements and post season. I feel maligned. This is a travesty of the greatest proportions. Why do you feel you deserve a fire ruby and 7 million silver? Due to the downtime issues, you didn't miss out on a fire ruby and 7 million silver, maybe a million to two at max. 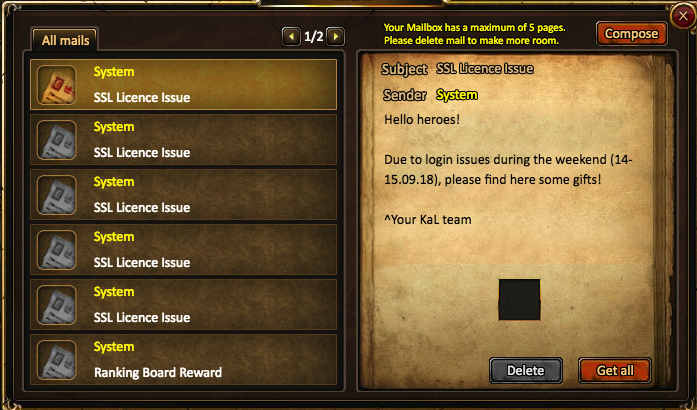 All servers experienced issues with post, maybe not everyone was hit by the battlement, but post was the biggest. How did S16 get set back? Also, you need to keep in mind that compensation is of good will, and good will along. It is not mandatory that they give it, if any. Yes, some compensation would be nice for everyone. The only difference S16 should get over other servers, is more silver. Two forum recharge event within 1 week? Yet no response on issues. Not even worth recharging considering how things are being handle lately. 20k for opal, definitely a great deal but long term wise not sure what direction were headed, unannounced merge, post issue, battlement bug and etc. I personally stopped until i see positive change/good news. I do agree with you there. Normally forum recharge events are months apart, but 2 within the space of a week? Thank you for the battlement compensation! Speaking of this event, when will rewards even be sent out? It doesn't state on the thread, and since you cannot get more than one of each, surely they can just be sent? anyone know what is this???? yea, why first one was empty?